Takara-Tomy caused quite a stir in the fandom with this Diaclone inspired Masterpiece Decepticon. Many fans threw up their hands in the air, frustrated that the MP line was getting a numbered release that wasn’t a “True” G1 transformer. I can understand their frustration, there are a large number of G1 Autobots and Decepticons still waiting for an MP release but this Diaclone inspired Wheeljack retool/repaint turned out to be explosively popular and exhaustingly (no joke here) sought after when the Phillip Morris Company filed a lawsuit against Takara-Tomy, preventing domestic sales of MP Exhaust. With Japanese retailers and proxies becoming the only way to purchase him, his aftermarket price shot through the roof and many retailers had to cancel preorders that were set up prior to the lawsuit. Fans who had previously written off Exhaust were now scrambling to get their hands on this increasingly rare curiosity. 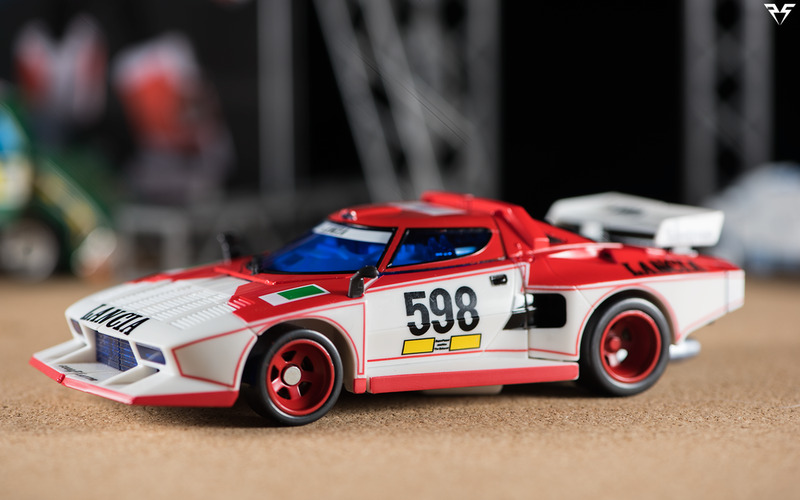 While Phillip Morris may have intended to stifle the sale of Exhaust, their lawsuit may have been the best thing to happen to Takara-Tomy as suddenly the demand for Exhaust went through the roof! I was able to procure a copy from my local hobby shop and here he is for all to see. Check out my review and I’ll let you know if Exhaust is just blowing smoke, or if he is a worthwhile addition to your MP shelf. 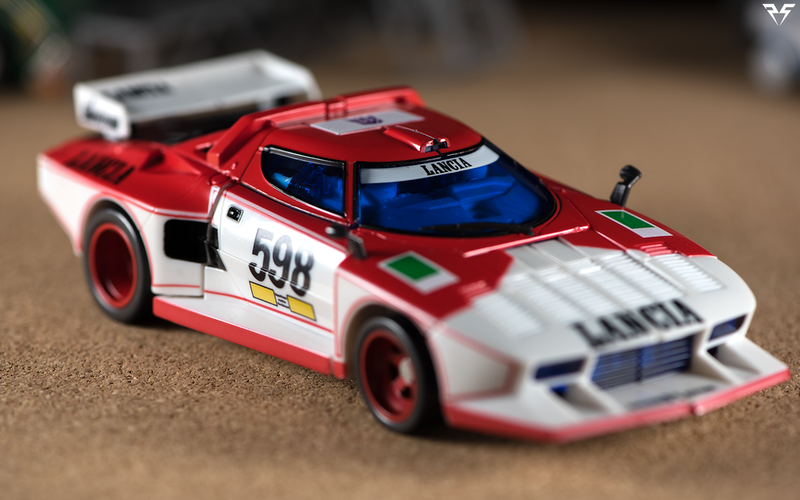 Vehicle Mode Exhaust’s vehicle mode is based on the Marlboro deco of the Diaclone predecessor to Wheeljack. There is not much going on in terms of retooling, but the deco change is drastic and really makes Exhaust stand out even next to his mold twin. His wing mirrors (2 pairs) came on separate sprues to prevent damage in shipping. 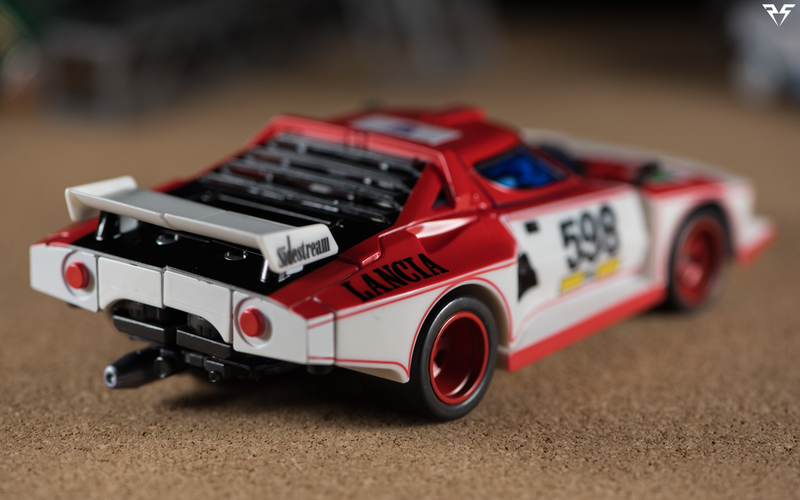 Being an officially licensed vehicle, he has the Lancia branding on his hood, windshield, spoiler, and his rear fenders. His front skirt piece has a livery on it that says “Good Flavor” simultaneously evoking Goodyear, and I feel poking a little jab at the original Marlboro deco. The rear spoiler has “Sidestream” liveries on the sides. The meaning of this one eludes me. The front grill on the vehicle is made from the same translucent blue plastic as his windshield and when the light hits it just right it looks great. His wheel rims are painted in a lovely deep red and his finished deco looks top notch in hand. He does have a few apparent panel gaps when assembled but for the most part he tabs together tightly and looks very cohesive in alt mode. There is no visible robot kibble in the alt mode, regardless of viewing angle. He has the same spring loaded tab as the other MP cars on his roof for weapon storage/armed vehicle mode. Robot mode Much like his alt mode, Exhaust’s bot mode shows very little retooling from Wheeljack. The main difference you’ll see is his new Diaclone inspired head! I absolutely love the design of his double visor faceplate and I think the head looks equal parts menacing and cool! Just be careful as the little side fins are quite thin and mine ended up with a stress mark from turning his head to the side. The head is on a twin axis joint, it can turn 360 degrees around and look up about 45 degrees. He has square ports on his shoulders for weapon mounting similar to MP Sideswipe and identical to Wheeljack. Due to how his main chest is formed sometimes moving his shoulders can cause the main body to start to separate. This happens on mine a bit as the shoulder joints are excessively tight. He has a universal hinge on his shoulder that allows for a broad range of motion and 90 degree hinges for the elbows. His wrists swivel and turn in a bit due to transformation. He has the standard MP hand articulation. He also has a full waist swivel and universal hinges on his hips. His knees can bend to a full 90 degrees, and you can get a little more if you un-transform his legs partially. He also has a nice ankle tilt and a little front to back on the foot. Accessories Exhaust comes with a small bundle of accessories. Included in the package will be a black sprue with 2 sets of wing mirrors. These can be snipped or snapped off the sprue and plugged in to Exhaust just in front of his doors. He also comes with 2 shoulder launchers similar to the one included with MP Wheeljack. One of the cannons has a slot in it for the other to peg in for storage in alt mode using the single spring loaded slot on his roof. He comes with 2 non-launching missiles for his shoulder launchers and also with a silver pistol, identical to the one that comes with MP Wheeljack. 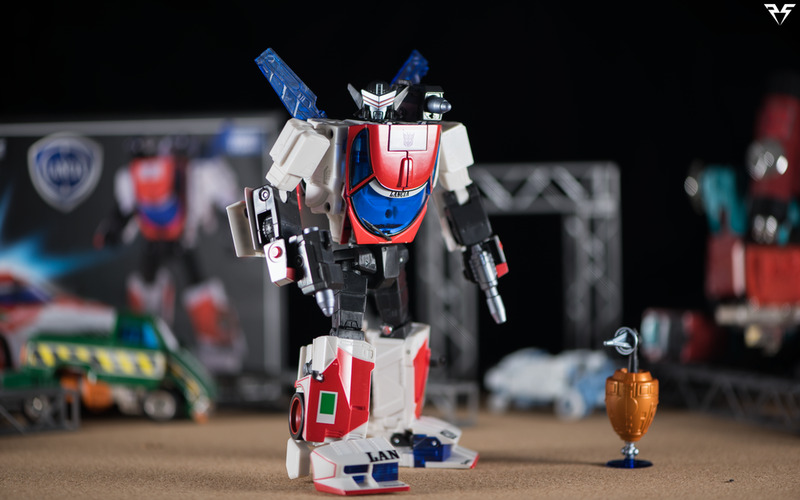 The most intriguing accessory for G1 TV show fans is Wheeljack’s immobilizer. The immobilizer comes in 3 4 pieces, the main body, the base, the stalk on the top and the little radar dish. It is assembled very simply just by sliding the pieces together. It looks great with Exhaust as a little doomsday device, and also doubles as an accessory for MP Wheeljack. He also comes with the standard trading card and instruction manual we’ve come to expect with MP releases. Exhaust is a cool addition to the rather lacking Masterpiece Decepticon ranks. His wicked head-sculpt and his great new deco do a lot to set him apart from MP Wheeljack in terms of looks and he makes a good looking display piece on the shelf. His transformation and posability are well executed and make him a fun MP to play with. He does look a little out of place with the other MP Decepticons as he’s the first one at this size, and is a little diminutive next to the Seekers, MP Soundwave and MP10B. If you’re a G1 purist, you’ll probably skip this release, or maybe just try to pick up the immobilizer device from it, but if you don’t mind adding a new Decepticon to your ranks regardless of origin you could do worse than MP Exhaust. 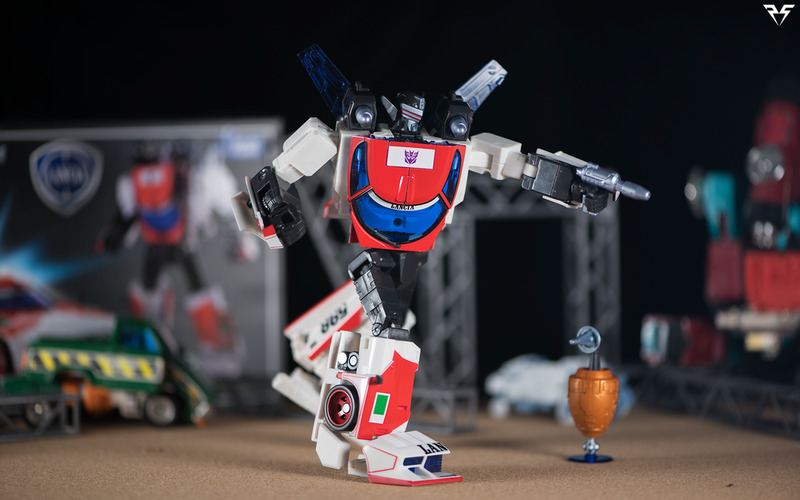 The Wheeljack mold is well designed and is a great example of where Masterpiece is going. 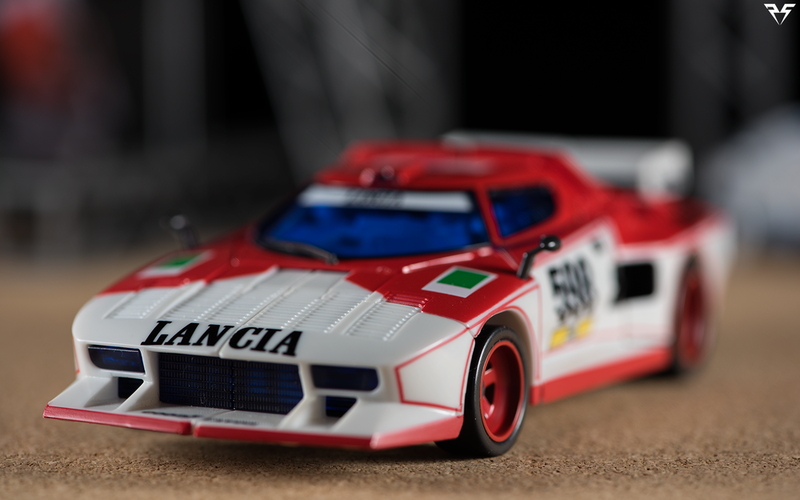 Do yourself a favor and at least get your hands on one of these Lancias before they disappear. Check out the gallery below to see more shots of Exhaust in action!